Stormwater Runoff – Summer marks the beginning of Florida’s rainy season, which means lots of water could be running through your landscape. While it’s great for most plants, the rainwater running off your landscape is not so great for our water supply. What most people don’t realize is that water running through storm drains doesn’t go to a treatment facility like the wastewater from homes does. There are a number of things you can do to keep water in your landscape and ensure that the runoff that does leave is as clean as possible. New Gardening Web Tools from UF/IFAS – Gardening decisions are now easier with the release of new mobile web tools from the University of Florida’s Institute of Food and Agricultural Sciences. The Florida-Friendly Landscaping Plant Guide is a web-based mobile application with information on more than 400 plants, and Landscape Pests lets users identify pests by plant or damage symptoms. Plant of the Month: Evergreen Wisteria — Evergreen wisteria is not only a beautiful vine, it’s also an excellent alternative to the more commonly seen Chinese wisteria, which is invasive. Sometimes called summer wisteria, this plant thrives in USDA zones 8 to 10 and will grow best in areas with full sun, but will tolerate partial shade. It will adapt to most soil pHs and can grow in any soil type, so long as it is well drained. July in Your Garden – Use summer heat to solarize the vegetable garden for fall planting. It takes 4–6 weeks to kill weeds, disease, and nematodes, so start now. Friend or Foe? Foe: Asian Cycad Scale — The Asian cycad scale put a major dent in the sago population throughout Florida, but the problem is seeing something of a decline. The damage from these tiny sucking insects initially appears as yellow or bleached-looking spots, eventually making the leaves brown and crispy. But the introduction of two beneficial predators, along with use of horticultural oils, is slowly making a difference. 2010 has brought record temperatures to Florida! As we’re working in our yards, we need to be aware of the heat and take precautionary measures. Here’s an excerpt from a Solutions for Your Life article that gives some tips on heat. Summer in Florida can be overwhelmingly hot, even for long-time residents. Heat stress, heat exhaustion, and heat stroke are illnesses that can overcome you when your body is unable to cool itself. 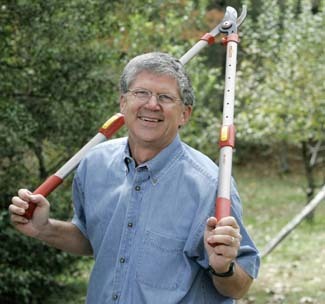 Floridians have a new tool to help them in the garden. “Your Southern Garden” with Walter Reeves is a new educational television show to help gardeners of all levels learn new tips, get fresh ideas and visit interesting sites. The show, produced by University of Florida IFAS Extension and the University of Georgia College of Agricultural and Environmental Sciences, is a one-of-a-kind program specifically for the Southeast. “Your Southern Garden” is a spin-off of UGA’s highly-rated “Gardening in Georgia,” which has aired on Georgia Public Broadcasting for a decade. Show host Walter Reeves, a retired UGA Cooperative Extension agent and nationally recognized gardening expert, brings the same down-home flavor to this new project. You may recognize Walter from appearances on DIY, HGTV and TurnerSouth garden shows. He’s also hosted a highly-rated call-in radio show on WSB 750AM in Atlanta for almost 20 years and has a weekly garden column in the Atlanta Journal-Constitution. Each week’s show includes a blend of how-to projects, visits to local sites and tips. UF Extension specialists and agents appear with Walter and there is a calendar of tips for what to do in Florida landscapes. The show began airing in select Florida markets in 2009. The 2010 season of “Your Southern Garden” began airing on public broadcast stations in north Florida in February and areas of Florida within the Georgia Public Broadcasting viewing area in April. The program will air weekly through the end of October. Check your local public broadcasting station’s programming listings for days and times “Your Southern Garden” airs in your area and visit our website: http://www.yoursoutherngarden.com. If the show isn’t available in your area, contact your local Florida Public Broadcasting station to request it. Do you love the sound of wind chimes in your garden? If so, watch this video with horticulture extension specialist, Erin Alvarez, as she teaches you how to make wind chimes from recycled materials. The Florida Master Gardener program now has a Facebook page! Stay up-to-date with state happenings, research developments, and other interesting information. Become a fan by clicking on the Facebook badge below. We really like EDIS. UF/IFAS peer-reviewed documents live on this site and we use it extensively for everything. We highly recommend becoming familiar with it. Some of the publications we have recommended in our e-newsletter, The Neighborhood Gardener, are listed below. These are just a few of the many great articles EDIS has to offer. Have you ever wanted to beef up on your plant ID knowledge? Well, now you have a quick and easy way to do just that. The Plant Identification Learning Module is an online tool that you can use to help with your identification skills. Each year during the Florida Master Gardener conference, teams compete in the plant identification and judging competition. The Plant Identification Learning Module is an online tool that you can use in preparation for the competition, or if you simply want to learn more about identifying ornamental plants, fruits, and vegetables. Also, see the competition rules and glossary. This is also a great tool to prepare 4-H youth for horticulture judging competitions. Check it out today and see what it’s all about! But first, can you identify this plant? Use the tool if you have to, but the first to answer correctly gets bragging rights!